What happens when you put five strangers in Saturday detention? Badass posturing, gleeful misbehavior, and a potent dose of angst. With the exuberant 1985 comedy-drama The Breakfast Club, writer-director John Hughes established himself as the bard of American youth, vividly and empathetically capturing how teenagers hang out, act up, and goof off. 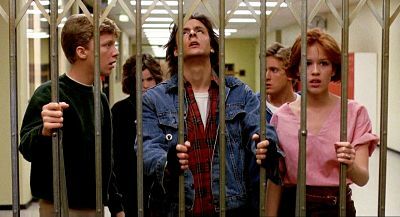 The movie revolves around—as if we need to tell you—a Saturday morning high school Saturday detention session with five teens: a jock (Emilio Estevez), the princess (Molly Ringwald), a brain (Anthony Michael Hall), the burn-out (Judd Nelson) and a weirdo (Ally Sheedy). Over the course of a day monitored by the dicky school principal (Paul Gleason), the quintet becomes closer than any of them could have imagined. With its highly quotable dialogue and star-making performances, this film is an era-defining pop-culture phenomenon, a disarmingly candid exploration of the trials of adolescence whose influence now spans generations.